David, thanks a lot for your suggestions and glad you liked the aesthetic. As soon as I get an other free evening, I am going to try these suggestions along with a few others and see how they feel. I gotta say I agree with Delca, the game has a simplistic beauty to it with the hex grid and the animated patterns underneath. I managed to kill the beast once with the advice in your last comment. It almost seems like there could be more clues to the beast's location. Hard to say exactly how though because you want to find that balance between something too hard (a straight up guessing game), and something that can become too easy (spending time to figure out his precise location so you'd never fail). Maybe if you take out all the other baddies in the level it will reveal just one of the X's next to the beast to help point you in the right direction? Anyways, great job! Hey Delca, thanks for trying this out. To progress, you need to shoot a bullet into the beast's cave (from a danger square -- you will die if you shoot into the wrong cave). I'm still working on the gameplay for this, so I appreciate your comments! 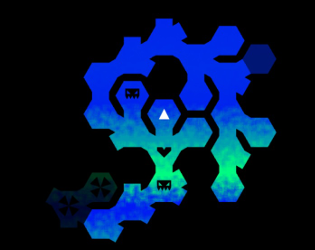 And yeah, hex mazes are so pretty! You should definitely generate some!!! The game felt quite polished, but even after four or five games, I am not sure I understood what to do. I eliminated every spawn, but is there a way to get to the beast itself ? 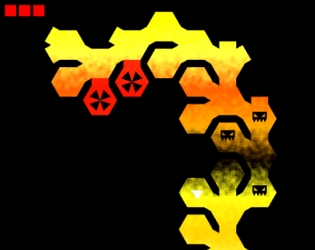 Other than that, hexagonal maze looks so good, I want to generate some by myself now.